The Monterey Bay Aquarium Seafood Watch program helps you choose seafood that’s fished or farmed in environmentally friendly ways. Through better practices, we can create healthy, abundant oceans for everyone. 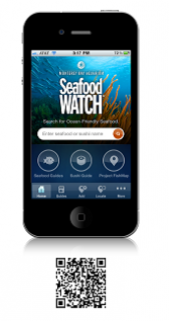 Seafood Watch, a program of the Monterey Bay Aquarium, has always been about making this vision a reality. Working with consumers, fishermen, restaurants, retailers and suppliers, they have been making a difference since 1999, and WAVE Foundation at the Newport Aquarium wants to help! The oceans supply us with food, help regulate our climate, and supply a livelihood for millions of people. Just as important, we depend on the oceans for recreation and renewal. But our seas are not the infinite bounty they appear to be. Today, no part of the oceans remains unaffected by human activities. And among the many factors influencing our ocean ecosystems, few have as great an impact as fishing. Humans have been fishing the oceans for thousands of years. But over the past five decades technology has allowed us to fish farther, deeper and more efficiently than ever before. Scientists estimate that we have removed as much as 90% of the large predatory fish such as shark, swordfish and cod from the world’s oceans. In 2003, the Pew Oceans Commission warned that the world’s oceans are in a state of “silent collapse,” threatening our food supply, marine economies, recreation and the natural legacy we leave our children. WAVE Foundation at the Newport Aquarium got involved with Seafood Watch to educate our visitors about the importance of choosing the right seafood. Humans are not the only ones being affected by the silent collapse of our ocean biodiversity. Animals such as the African Penguin have to travel further for food, and when this is a requirement they are less likely to have the energy for breeding. These issues, on top of the current habitat loss issues, are devastating many animal species. 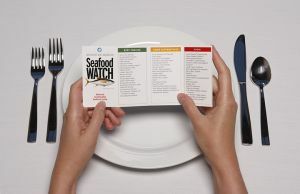 You can help by monitoring the seafood you eat by following Monterey Bay’s Seafood Watch Guides! Make smart choices and look for sustainable seafood options at your local grocery stores or restaurants. 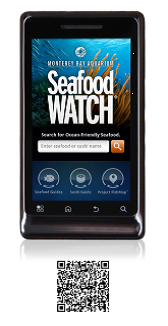 View the different Seafood Watch Guides below, or download the Seafood Watch App for your phone!